With over 20 years experience of developing and operating award winning camp sites we are pleased to offer our expertise to those wishing to commence in the industry or those who have a campsite but feel they need some assistance. We are able to visit you and discuss any aspect of your operation and offer solutions – from planning and facility development through to marketing and even operating aspects of your business on your behalf. 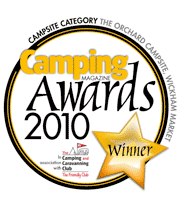 We have a team of professionals ready to help including those involved in the establishment and operating of The Orchard Campsite (Camping Magazine Best Campsite Award 2010 – one of the original Top 40 Cool Sites (Punk Publishing) – selected by Time Out for their UK Top Campsites publication 2010 and the Rough Guide 2010 publication.